Trucking is not for everyone because it is not only a job but it becomes part of your lifestyle. We all are aware of that or at least we should be. Only a certain few can sustain a career that involves spending weeks on the road away from home. That’s where trucker dogs come in. Trucker dogs can alleviate the strain that comes with spending so much time on the road. As with any other pet, trucker dogs are known to improve the overall physical and mental health of their owners. A happy and healthy trucker means that he or she can operate under the best and safest conditions. A trucker that returns home safe and sound ready for the next load is never a bad thing. Trucking companies with pet friendly policies report an overall improved turnover rate of their truckers. As a result, trucker dogs are becoming more and more popular. It’s like having “bring your pet to work day” everyday. Trucker dogs work along side their owners day and night delivering all of those essential goods we just can’t live without. Trucker dogs are quickly becoming part of the trucker lifestyle. Not all trucking companies have a pet friendly policy but the few that do see it as an essential part of their benefits program for their company. What About Those Truckers Who Aren’t Necessarily Dog Lovers? Trucker pets aren’t limited to dogs; cats, lizards, and even birds are welcomed too. So if you’re more of a cat person you can bring your buddy along for the ride. Not all trucking companies are created the same. Pet policies differ from company to company. Click on the link below to view trucking companies that currently have a pet friendly policy. 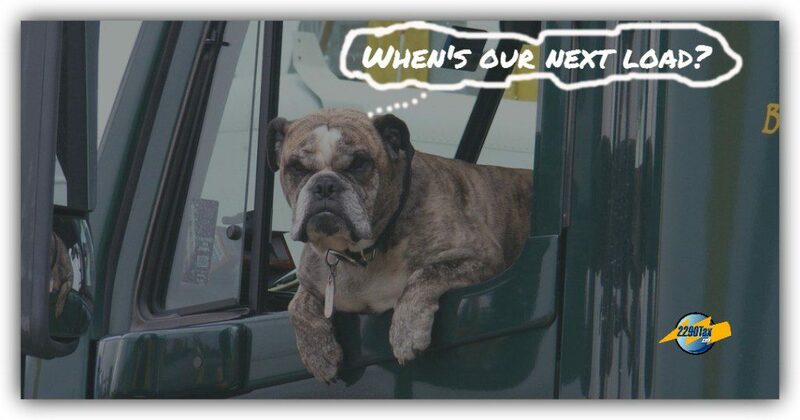 Pet Friendly Trucking Companies Here! Next time you see a truck on the road keep an eye out you might get lucky and see a trucker dog.